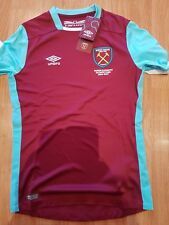 West Ham football shirt and shorts in excellent condition, size 6-7 years Collection in person welcome from Ashford Kent but cash on collection only please Thanks for looking and happy bidding! Brand new West Ham home shirt from the 08/09 season in an adult size small. The shirt is printed with legend Bobby Moore name and number 6. This shirt has a tag but has came off during storage. Never worn, so listed as new without tags. THE SHIRT IS PRE WORN AND IS IN EXCELLENT CONDITION. > Junior Football Shirt. > Shirt sleeves. Football Jersey - West Ham United. Extra Large - 46" Chest. Get Supersized Images & Free Image Hosting. 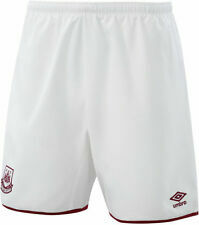 Umbro West Ham United Training Jersey. Material - 100% Polyester. THIS SHIRT IS HIGHLY SORT AFTER AS ONLY 8,000 WERE DONE! SMALL only left: 1. West Ham United shirt for 12-13 years, BRADFORD 6, Umbro, VGC, with UK FREEPOST! For approx 12-13 years (LB), a rmpit to armpit is 46cm, length 66cm. Make sure you show your support for Manuel Pellegrini and the team as they take the Premier League by storm! 100% Polyester. Features Rice 41on the back of the shirt. Size: Small. Material: 100% Polyester. Made by Umbro. It is our joy to find you that long lost shirt, that one shirt you wore when you were a child, that one shirt that completes your collection. Size: Large. Material: 100% Polyester. Rare original umbro West Ham football shirt. 2016-17 queen Elizabeth Olympic Park edition. Uk Adults large. > Junior Football Shirt. > Machine washable. > Body mapping technology. > Round neck. West Ham United. Football Shirt. Authentic Umbro Shirt. Excellent Condition. West Ham United. Authentic Umbro Shirt. BACK OF NECK - HEM :- 21 ". Size - Boys - XLB (36" around chest). 100% Polyester. ★See more football shirts here ★. ★ See more football shirts here ★.